'My Vertical Color Picker' is a color picker which allows a variety of operations like grabbing colors from your screen, selecting colors using the built-in color pickers (RGB and Hue), dragging color chips around, adding text to each color chip, creating snapshots for the current palette, searching for created palettes and many more. There is no limit to the number of color chips you can use for a palette. 'My Vertical Color Picker' is a revolutionary color picker application to manage your collection of colors while allowing a variety of operations like grabbing colors from the screen, selecting colors using the built-in color pickers (RGB and Hue), dragging color chips around, adding text to each color chip, creating snapshots for the current palette, selecting colors from your screen, searching for created palettes and many more. There is no limit to the number of color chips you can use for a palette. 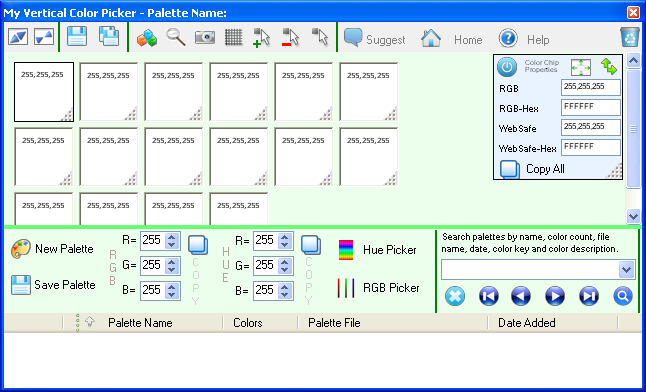 - export palette color information and color chip color information to R,G,B, WebSafe, R,G,B-Hex, WebSafe-Hex.